We arrived in Argentina just in time for the biggest pride parade in the country – the 21st gay pride march in Buenos Aires. The parade starts on the Plaza de Mayo, in front of the Casa Rosada (the office of Argentina’s president) and follows the Avenida de Mayo up to Congress. Argentina is the gay-friendliest country in Latin America and has improved gay rights significantly over the last few years. 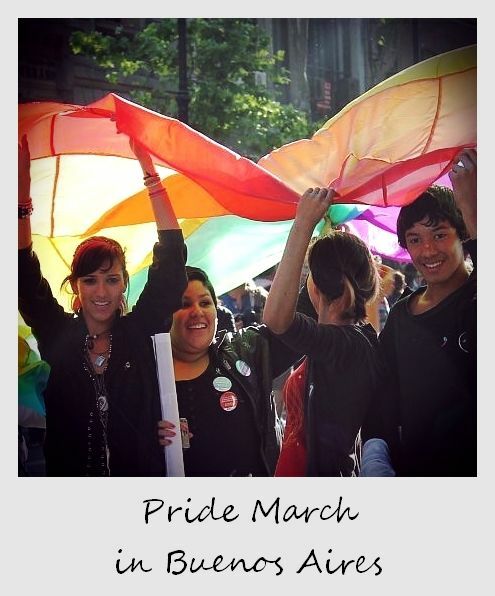 The first country to legalize gay marriage (including adoption rights) in 2010, Argentina is also the first South American country to approve a gender identity law, which grants people the right to change their physical gender identity without having to undergo a longsome psychiatric and judicial process beforehand. That looks wonderful! I would’ve loved to have been there. I’m really looking forward to seeing how Buenos Aires compares with the big west European cities I know in terms of acceptance of homosexuality. I have high hopes! It’s good to see the rain didn’t ruin the fun. That is also an interesting bit of history about Argentina being a leader of rights in the area. Thanks, we definitely feel comfortable here as a gay couple.